A gloomy damp day at Bescot on March 11th 1979 finds Class 25 No.25222 keeping company with a variety of locomotives. The seventeen year two month career of D7572/25222 included five years at Holbeck with the remaining twelve years allocated to a variety of London Midland Region depots. August 1967 to Holbeck (55A), on loan then permanent same month. March 1973 to London Division (D01). 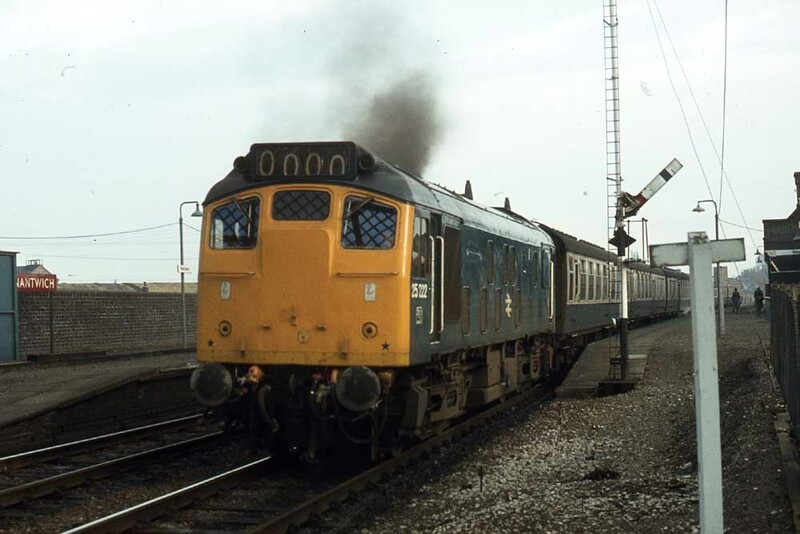 25222 was the 82nd Class 25 withdrawn, one of seventeen Class 25s retired during December 1980. 25222 was moved to Swindon Works by October 30th 1980, six weeks prior to the withdrawal date. 25222 was broken up at Swindon Works by Christmas 1981. Noted Derby Works March & June 1966. Noted Derby Works April & May 1976. 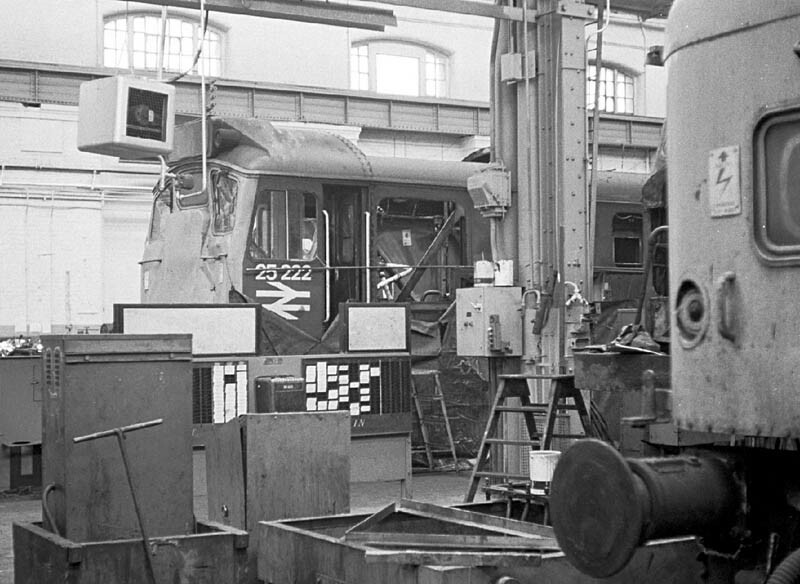 Photograph courtesy Tony Sayer A heavily stripped 25222 at Derby Works on April 7th 1976. The cabside sports an interesting number/emblem combination, which will soon be history as the cab will be replaced because of the damage to the front. Despite being boiler equipped D7572/25222 acquired a very modest accumulation of passenger workings. The first recorded working took place on April 28th 1964 working a roundtrip Anglian TUCC special between Cambridge & Bletchley. Like many others D7572 worked a round trip with the Nottingham - Llandudno Town summer dated service, in this case on July 8th 1967 with 5294. Photograph collection of webmaster A work-stained 7572 at Leeds sometime during 1969, most likely on the Bradford - Leeds portion of a NE/SW express. Two Holbeck workings on July 31st 1971 commenced with the 17.49 Poole - Bradford Exchange from Sheffield to Bradford Exchange, followed by the 21.24 Bradford Exchange - Kings Cross as far as Leeds. Condition January: blue/yellow livery, bodysides were a patchwork of blue paint, gangway doors sheeted over, two numbers on each bodyside, BR emblem on each cabside, blanking plates fitted, hand/footholds plated over, No.2 cab front missing center lampbracket and other fittings. Sometime after this point in time the numbers were moved to the cabside, above the BR emblem. During its Classified repair at Derby the No.1 cab retained the central lampbracket and other fittings whilst whilst the replacement No.2 cab was missing those items. A Royal Train working on June 22nd for the French President (Gatwick – Victoria). 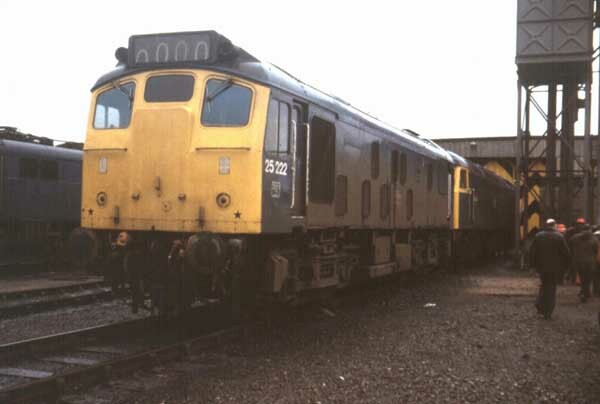 Class 31’s were used for this working but 25222 was used to get the coaching stock back to the LMR – Wolverton? It was off to Skegness with 25203 on July 17th 1976 with a morning Leicester - Skegness, returning with the 12.35 Skegness - Leicester. On May 16th 25222 worked the evening Stoke - Healey Mills freight. With 1977 being the Jubilee Year for Queen Elizabeth II, the monarch and family made many public appearances, making considerable use of the new Royal Train. A visit to Stockport on June 21st ended with the Royal Train utilised for the journey to Porthmadog. The journey west of Shrewsbury was handled by 25221 & 25222. After staying overnight at Porthmadog the train ran to Harlech, where the Royal Family took to road transport. From Harlech the empty coaching stock was taken forward by 25218. 25222 & 25221 were back at Crewe by June 26th. Photograph collection of webmaster 25222 & 25221 at Springs Branch sometine during 1977, possibly related to the workings described above? Visible on the driver's side of the cab is the radio communication cable and its connector box draped over the handrail. 25221 & 25222 were noted on July 26th bringing the Royal Train empty coaching stock from Wolverton to Newcastle, via Carlisle. At Newcastle Princess Anne boarded for the journey to Dumfries. On November 12th 1977 25222 worked the 07.50 Cardiff - Crewe and the next day's 13.45 Crewe - Cardiff. 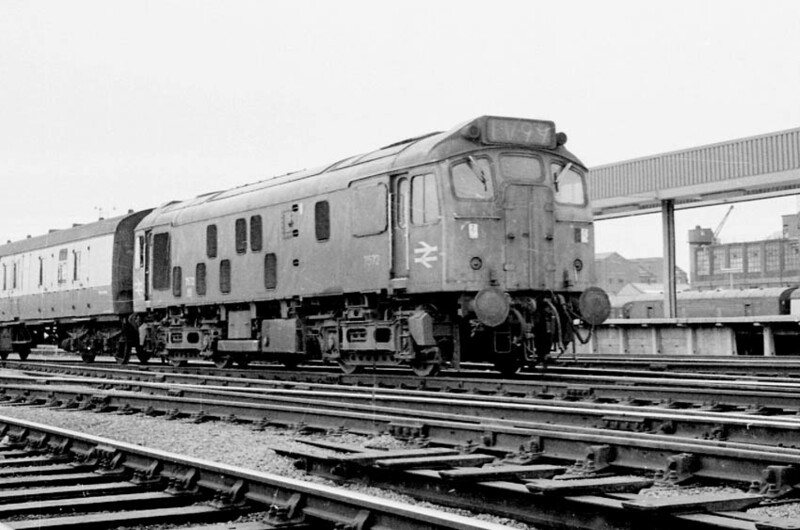 On November 15th 25222 failed at Hereford working the 07.50 Cardiff - Crewe and was removed to the stabling point. 1978 opened with 25222 working January 7th's 12.22 Crewe - Cardiff. Photograph courtesy Peter Lovell On January 7th 1978 25222 heads away from Nantwich with the 12:22 Crewe – Cardiff. After photographing an ex-works class 40 on the Crewe Works test train in the opposite direction it was three hours in the pub before continuing with 25055 on the 16:00 Crewe – Cardiff. On March 4th 25222 worked the 12.22 Crewe - Cardiff. 25222 & 25217 were noted passing Stoke on Trent with a lengthy freight on April 20th. On the night of June 27th 25222 was stabled at Cricklewood. August 2nd found 25222 back on the Crewe - Cardiff line assisting a diesel multiple unit failure. On October 17th 25222 & 25063 were noted northbound through Crewe, possibly with an Oakamoor - St Helens sand train. On January 8th 25222 worked the 12.48 Holyhead - Euston to Crewe. 25222 was stabled at Stonebridge Park on January 12th. On January 24th 25222 worked the 12.22 Crewe - Cardiff. On June 2nd 25222 is assumed to have worked the 07.50 Cardiff - Crewe Cardiff. 25222 was noted at Cricklewood depot on September 20th & 22nd. 25222's last passenger workings took place during 1980 and they proved to be quite a mixture. On February 9th 1980 a Stoke-on-Trent - Norwood Junction football special was worked out & back by 25222 & 25189. Further to the above incident comes information from Andrew Carlile, who was travelling on a train behind the Manchester express. 'Ironically we were on the Euston to Liverpool train that day. Cannot recall the exact time it should depart, could of been 19.45 or 20.00 but it was held up because the guard did not arrive for the train. Therefore train left late and was immediately behind the Manchester train. Potentially it could of been our train that derailed that day. Anyway we were stuck immediately behind the derailment for over 4 hours. As mentioned 25222 was in the area and this locomotive dragged our train back to Euston arriving back at 1am. 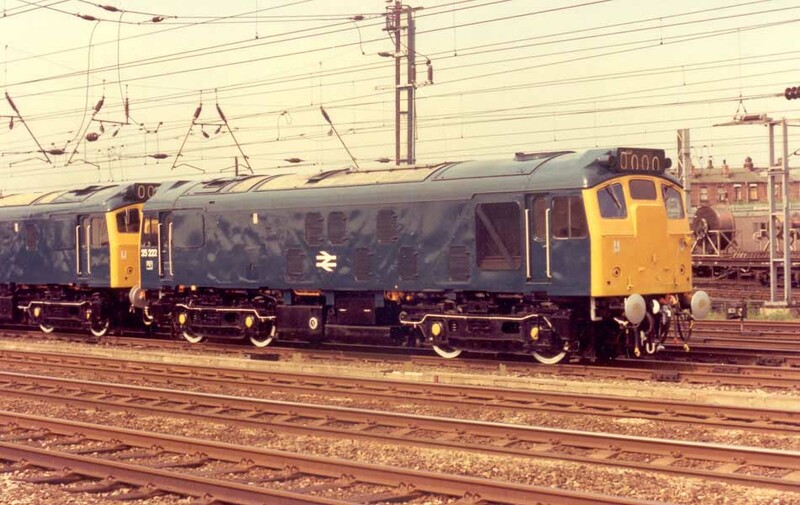 I remember the Class 25 at the buffer stops at Euston. Think the train engine was an 87 but we were then bussed from Euston to St Pancras. They had laid a relief train on at St Pancras but we were on last bus and they let the train go before we arrived!! Another relief train arrived with a Class 45 which took us to Nuneaton and changed to electric traction to Runcorn. An eventful day but I do remember the Class 25 having to work really hard and slowly dragging train back to Euston'. On April 3rd (Maundy Thursday) 25222 & 25054 worked the 09.50 Nottingham - St Pancras relief. The weekend of April 6th/7th proved to quite hectic for 25222 & 25054, on 6th they worked a roundtrip Leicester - Scarborough excursion, whilst the following day (7th) they worked a roundtrip Nottingham - Barry Island day excursion for a weekend total of 623 passenger miles. 25222 was noted Clayton Bridge, Manchester on April 16th with a lengthy freight. For two days in April 25222 was back on the Crewe - Cardiff line, working the 19.30 Crewe - Cardiff on 18th and the next day's 10.00 Crewe - Cardiff and an unidentified return working. On May 3rd 25222 worked the 07.50 Cardiff - Crewe. As a Cricklewood locomotive 25222 most likely worked the Kensington Olympia motorail many times, on June 28th 1980 25222 & 25193 worked the 08.55 Kensington Olympia - Perth the two miles to Willesden. The final recorded passenger working was perhaps a fine tribute to a five year veteran of Holbeck when on August 9th 1980 25222 with 25061 worked the 18.08 Penzance - Leeds forward from Birmingham New Street. 25222 was withdrawn on December 14th 1980. Non-BIS side:six foot scrape to right of radiator panel October 1978. Page added May 29th 2013. Last updated January 12th 2019.